Food is an essential part of everyone’s lives. A meal after a long day of work, feels like a treasure. We relish every bite of food that we get. It gives us happiness. Now imagine, the plight of those helpless children who don’t have the privilege of feeding themselves even a single meal a day. They fill their stomachs on very little food or most days, eat nothing at all. Every child deserves proper food and education- so all children are nourished to learn and grow. By the time a child reaches the age of 5 about 90% of its brain development is complete. Proper nutrition and learning is needed from day one to give every child the best start in life. Getting little or no food slows down the brain and body development of a child and there are thousands of such helpless children living somewhere among us. While it’s difficult to understand their pain closely, a noble NGO is doing their part of feeding as many children as possible, through their mid-day meal scheme. ISKCON Food Relief Foundation Haryana is a Food for Life organisation that serves more than 3.5lakh meals per day in more than 2,500 schools of Haryana. They provide the gift of healthy food to as many children as they can. They understand the importance of food and proper nutrition, which is necessary for the growing children. There are more than 3.5 lakh children who leave their homes in the morning for school, not worrying about staying hungry for the rest of the day. And most of them come to school only for the food they are getting as it is their only meal of the day. They receive the education required and are able to grasp the knowledge better. Proper nutrition helps them to stay focused and concentrate better in their studies. It helps in the development the child’s brain. They pass exams without knowing the nutritious food is helping them to concentrate due to robust health and mind. The foundation has been serving hot and fresh nutritious meals prepared with the highest standards of hygiene and quality ingredients that meet the nutritional requirements of growing children. The mid-day meals are prepared in ISO certified 4 state-of-the-art kitchens located in different cities of Haryana. Preparing healthier school meals can be a channel for change in our food system, bringing wider access to healthy options. 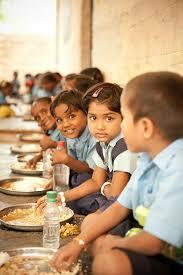 Mid-Day meal is provided as an incentive for children to attend school. It is necessary to attract children otherwise some parents from the lower socio economic group would rather engage them in child labour. At IFRF Haryana, every second 3 children are fed. Meals in 2000 schools are delivered in 2 hours and tonnes of food is prepared: 145 quintals per hour. The vice chairman of IFRF, Haryana, Mr. Dhananjaya Krishna Das believes that there should be no compromise with the quality and quantity of food being prepared in their kitchens. The pure and sattvik food prepared in holy kitchens reminds the children of maa ke haath ka khaana. The food is simple yet delicious and the children savor and value every bit of it. Every meal is untouched by the time it reaches the children and the first hand that touches, is the hand of the child. Let’s treat all our children better so they can learn, laugh and enjoy the happy life they deserve. Let’s take pleasure in watching them grow up to be the people that look after this great world of ours. Let’s give them a brighter future by doing our part of donating them the little we can. A small Step by step we can make a change and see malnutrition decreasing literacy level increasing.